How to watch HD MKV videos on Iconia Tab A700 without any issues? Maybe you have tried to download MKV to Iconia Tab A700 for playback directly. The results won’t be satisfactory. There will always be a variety of problems. No audio, no video, even pop-up an error message. It’s a great pity for people who have many MKV videos, for this reason, it’s necessary to find a solution so as to play MKV on Iconia Tab A700 successfully. In advance, we’d better figure out why Iconia Tab A700 can’t play MKV well. According to its specs list, we can learn the video formats compatibled by Iconia Tab A700. MKV not included. Due to this, we won’t get good results. After several tests, a good format for Iconia Tab turned out, it’s MP4. Not only Iconia Tab, even all the android tablets are friendly with it. So if we convert MKV to Mp4, our problems will be solved. How to do it? Don’t worry, just follow me, you will make it. MKV is a popular format, widely used by many film producers. Its popularity owing to the high defination viewing experience and the famous “Multiple subtitles, multiple audio tracks”. However, this format isn’t compatibled well with most tablets, no matter Apple’s iPad or Android tablets. Selecting an external player for your tablet is a solution, but for people who own a large number of MKV videos and have high demands on video quality. This solution isn’t satisfactory. MKV is a typical container format. Though the video are all with .mkv extension. They use different video and audio codec. For example, if the player you installed for your tablet can play a mkv video file, but not sure it can play other mkv videos. In order to get the as well as original viewing experience, and watch all mkv movies on tablets, you need a professional MKV converter. Which is produced by Pavtube Studio. 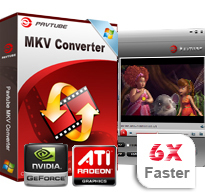 It could help you to convert MKV to MP4, MKV to WMV, MKV to AVI, MKV to MOV, MKV to FLV etc. What’s more, there are many presets for tablets and smartphones, to help you easily get the best video format for your device. Including iPad, iPhone, Apple TV, Samsung Galaxy Tab, playbook, kindle fire, nook color, Transformer Prime, Motorola Xoom, HP TouchPad and more.